The Vulcan is a move that can be tricky to learn on the water, it requires the right technique without time to think during the move; from start to finish the Vulcan is complete in just a few seconds. The technique for a flat water Vulcan is the same on the TurfDog as on the water. 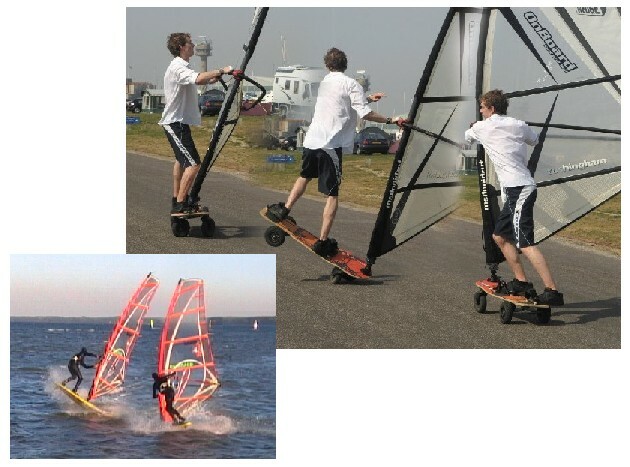 A mistake many people make is to think of the vulcan as a jump and then spin, this is not the case, in a flat water Vulcan the nose of the board does not even need to leave the water, the same goes with the front wheels of the TurfDog boards. Bounce off the back foot, keeping the sail sheeted in (sheeting out sends the nose up making it harder to rotate the 180). Sheeting in on initiating the manoeuvre sends you up and over the nose onto the new tack, exactly the same technique on the water dips the nose into the water sending you round. You must also look back towards your new direction. 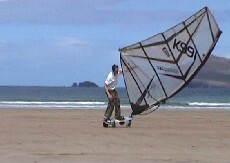 As you rotate round, drag the sail across your body and place your hands on the new side of the boom. The most common errors on the Turfdog are to not staying sheeted in enough on initiating the move and not dragging the sail across your body, these are also the most common errors during Vulcans on the water.